I saw this recipe way back in the spring when Cassie first posted it and immediately, it got bookmarked. I’m embarrassed to say that I still haven’t made it. I have no idea why, buffalo wings are seriously one of the best parts of life. What I would give to go back to the Hanover Grill in Carlisle, PA for 10 cent wings on Thursday nights in college… So anything that claims to taste like it, I’m in. 110%. The thought of this on a cold winter day almost makes me excited for the cooler weather when I get back. Almost. I’m so excited Cassie was up for sharing her delicious recipe with you all. Dig in! Love buffalo wings? Then you’ll love this cheesy, spicy, buffalo chicken soup with orzo. It’s a simple and easy meal that’s ready in just 30 minutes! Hey there, Running to the Kitchen readers! I am so excited to be here on Gina’s blog today. I “met” Gina earlier this year when we both, unknowingly, posted arugula pesto on the same day, and we have been blogging buddies since! If you have followed my rants in the kitchen for any length of time, you probably know that I have a crippling obsession with Frank’s Red Hot Sauce. As-in, it’s sort of my ketchup. My husband loves it and I love it and we are two-peas-in-a-pod with our love for buffalo wing sauce. So why not put your favorite condiment into soup? There is really no reason not to. People who love buffalo chicken wings should eat a soup that tastes like buffalo chicken wings. There is another reason you should make this soup – It. Is. So. Simple. I’m talking thirty minutes flat and dinner is on the table. And don’t let me forget to mention that the leftovers are even better. Make the soup, and come and see my other buffalo chicken creations at Bake Your Day! Thanks for having me Gina, hope you are having a fabulous vacation! Love buffalo wings? 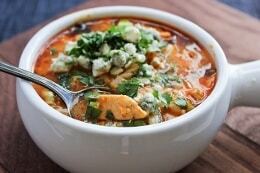 Then you'll love this cheesy, spicy, buffalo chicken soup with orzo. It's a simple and easy meal that's ready in just 30 minutes! Cook orzo according to package directions until about half way done. Drain and set aside. Heat olive oil in a large Dutch oven. Saute yellow onion, garlic and half of the green onions in the olive oil for 2-3 minutes until the onions are opaque and fragrant. Add carrots, ranch mix and 2 tablespoons cilantro. Stir to combine and saute until the carrots begin to soften. Add chicken broth, buffalo sauce, cheddar, parmesan and shredded chicken. Stir to combine and bring to a simmer. Reduce heat and simmer for 10 minutes, until the carrots are tender, but still have a slight bite. Bring the soup to a boil, add the underdone orzo and stir frequently until orzo is al dente. Serve with sliced green onions, additional cilantro and blue cheese crumbles. -Store-bought ranch dressing mix would be a great substitute if you prefer to not make it. If you don't have any orzo on hand, switch it out with your favorite pasta, or choose rice or quinoa. Ooh, that looks delicious! It’s definitely soup season…yay! Dam Girl! I need to make this!! Oh my gosh! The pictures having me drooling!! I’m speechless, all I can say is yum!!!! 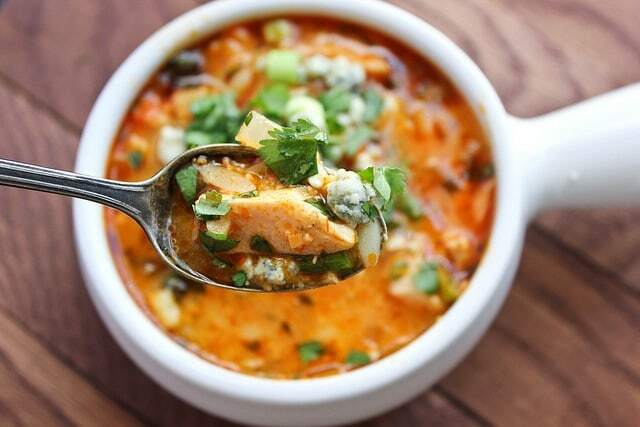 My brother (who goes crazy for buffalo chicken dip) would LOVE this recipe. Omg! Buffalo chicken anything is amazing!! Now with “soup season” approaching I MUST try this!!! Thanks!! yumm this looks awesome. I made buffalo chicken enchiladas this weekend, so I definitely should keep the buffalo wing theme going. thanks for sharing, Cassie and Gina! I am very excited to try the soup recipe. Hi ladies! I’m not sure what happened to the Ranch mix, it could be from a blog migration that I did last year. Until I figure it out, here is the recipe: 1 tsp. dried parsley; 1 tsp. dried dill; 1/2 tsp. onion powder; 1/4 tsp. garlic powder; 1/8 tsp. dried thyme; 1/8 tsp. salt; Sorry about that confusion!! Sorry ladies, no idea why the link isn’t working, it seems to be hyperlinked correctly. Thanks for writing the recipe out, Cassie! i have been obsessed with buffalo chicken anything these days – i would probably eat the whole batch! Thanks for having me Gina! I’m not sure what happened to my ranch mix recipe though! I want this. Right now! DELICIOUS! This buffalonian loves anything and everything chicken wing related. I am absoultely giving this recipe a try during the winter! Anything buffalo chicken is good!!!! wheeeey, I love orzos in soup. they are just tooooo delicious. you remembered me of getting a pack soon – and, that’s quite randomn, of a russian milk soup my mum used to make – more of a sweet breakfast thing. Have to ask her for the recipe anyway. what a great idea, and tasty looking dish. going to make this soon. hope y’all enjoying Italy! I made this last nite, and it is fantastic! very easy to make as well. highly recommended! This looks delish! What an awesome recipe! Must try this as soon as I get the rest of the ingredients. Can’t wait, I love soup on a cold, snowy, day. Thanks so much. This is a great recipe. Because I am allergic to dairy it would seem I leave out the most important flavors, but that’s not true. It tastes so flavorful and all I do is sauté the onions and carrots, garlic, add the broth, hot sauce, and chicken (I even use thighs it’s cheaper). I omit the ranch seasoning and cheeses…and it still ROCKS. Thanks. 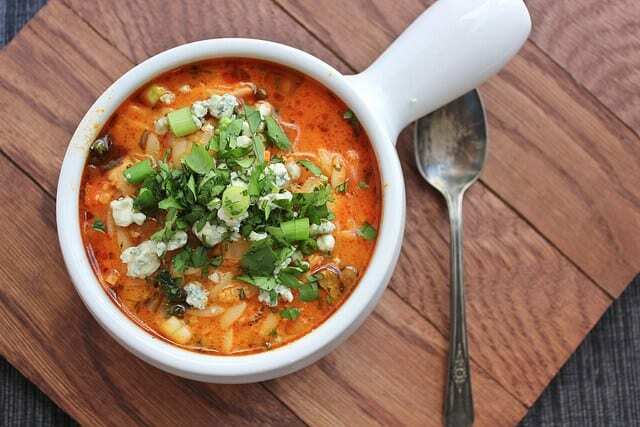 Pingback: 101 Tasty Soups, Stews and Chowders to Make This Winter - EAT. CRAFT. PARENT.